Definition at line 535 of file ketypes.h. Definition at line 542 of file ketypes.h. Definition at line 554 of file ketypes.h. Definition at line 553 of file ketypes.h. Definition at line 555 of file ketypes.h. 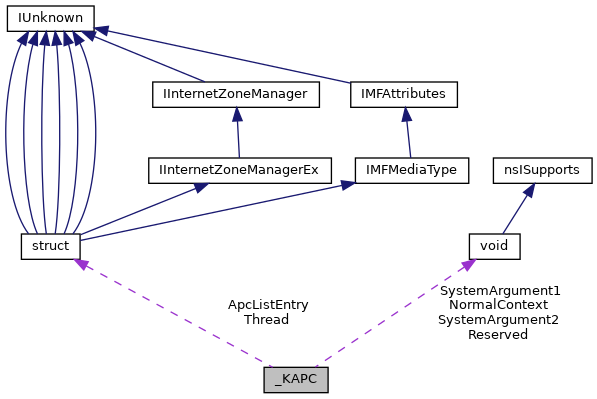 Referenced by KeFlushQueueApc(), and KiDeliverApc(). Definition at line 550 of file ketypes.h. Definition at line 548 of file ketypes.h. Definition at line 538 of file ketypes.h. Definition at line 537 of file ketypes.h. Definition at line 539 of file ketypes.h. Definition at line 540 of file ketypes.h. Definition at line 551 of file ketypes.h. Referenced by KiDeliverApc(), PsGetContextThread(), and PsSetContextThread(). Definition at line 552 of file ketypes.h. Definition at line 541 of file ketypes.h. Definition at line 536 of file ketypes.h.